Housing is quite variable across the Mountain Resources Commission (MRC) region, and can be compared based on a variety of metrics. 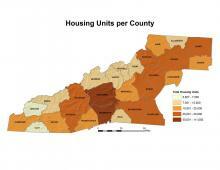 The first map shows the number of housing units per county. This map resembles the total population map for the region; the more people you have, the more houses you need. However, the map only begins to tell the story. The graph shows the difference in single-unit structures, multi-unit structures, and mobile homes. 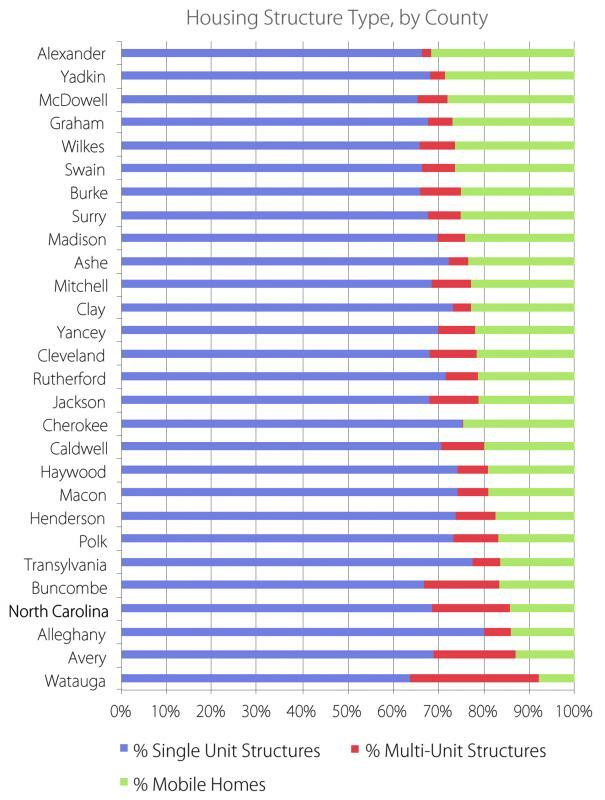 In all of the counties, there is not much variance in the percentage of single-unit structures, at about 70 percent of the total. This reflects the rural nature of the region. Note that only Buncombe, Watauga, and Avery Counties have large percentages of multi-unit structures (apartments and condominiums). 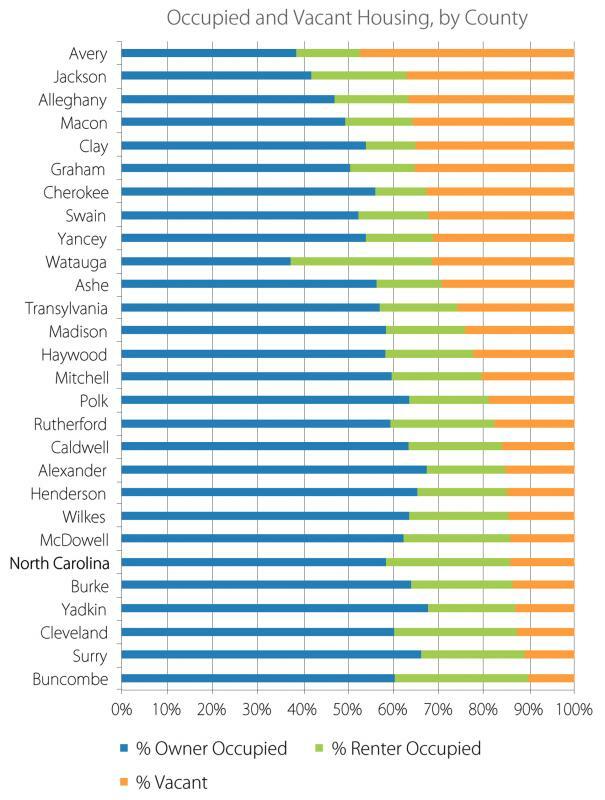 One statistic that is striking is the abundance of mobile homes – only three counties in the region have fewer mobile homes than the state average. The abundance of mobile homes in the region is probably related to the lower cost of owning or renting a mobile home versus that of other housing types. The second map, displaying median home price, shows that counties with a large percentage of mobile homes also show a lower median home price. How are these dwellings being utilized? The second graph shows the percentage of occupied versus vacant dwellings, with the occupied category being divided between owner-occupied and renter-occupied. The vacant percentage includes residences that are used only seasonally. 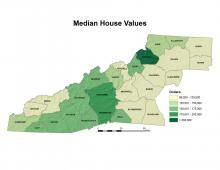 Ten counties in the region have vacant percentages higher than 30 percent. One other interesting point to notice in the graph is the anomaly seen in Watauga County. 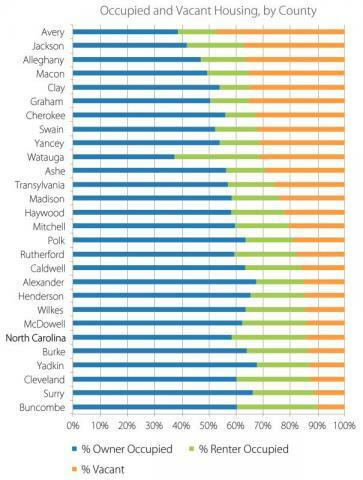 There is an almost even distribution between the three categories of occupancy in Watauga – the only county in the region to exhibit this distribution. This is probably due to the presence of Appalachian State University and the nearby ski resorts. The statistics show a large and growing discrepancy in housing cost, utilization, and affordability in the mountains. There are many large, expensive homes used only a few months a year, but there is a growing demand for entry-level homes and for more affordable housing for either renting or owning.